Ever since mankind started walking upright (and who knows even before) they have had to come up with solutions to carry and store that elixir of life… Water. As a planet we have an abundance of water, but the sad news is that only a very small percentage is drinkable or usable for irrigation, animal husbandry or just about any enterprise we’re involved in. Cultures, particularly in arid areas, came up with ingenious and surprisingly sophisticated methods of saving water, the basis of which are still used today. About 5000 years ago and in the same era that the Egyptians were building a great empire in North Africa and Mesopotamia was the centre of the Arabian world – a great civilisation flourished along the banks of the Indus River in modern-day India and parts of Pakistan and Afghanistan. 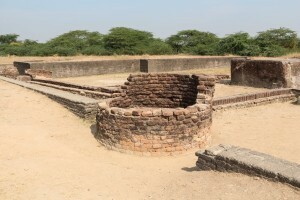 In between revolutionising various handicrafts, metal forging techniques (it was the Bronze Age) and building houses with baked bricks, the Indus people were also innovating a really brilliant water supply infrastructure that was way ahead of its time. This has got archaeologists very excited. The people of Indus figured out that to prevent nasty stomach bugs like dysentery and cholera spreading through the city like wildfire, they had to have a way of keeping the water supply clean. So what got the archaeologists all in a flap? Well they had found arguably one of the oldest water harvesting systems in history. Digs revealed covered drains running under the streets of two of the major cities, and all the houses had rainwater harvesting systems on the roofs that drained into underground water storage tanks. The same rainwater harvesting are still practised in India and a lot of the earthen pipes and tunnels are still being used. They also had nifty rest-stops of water storage tanks cut into rocks with drinking water for thirsty merchants travelling the trade routes. While forts in the area all had their own water harvesting and storage systems of cisterns, ponds, tanks and wells. Their not-so-near neighbours, the Ancient Egyptians weren’t too shabby on water storage either. Given their reliance on kind river gods and the annual flooding of the Nile to sustain their food crops and flax for their famous linen, they pioneered the basin system. 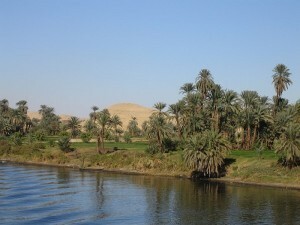 They built a hive of earthen banks running parallel and perpendicular to the Nile that created different-sized basins. When the sluice gates were opened, it would release water into the basins, where it would sit until the soil was well-soaked. Any water left on the surface was then drained off to a basin further down the hill or to a nearby canal, allowing farmers to plant on their drained allotments. Enter the Romans. Famous for conquering most of Europe, they are also the aqueduct rock stars of their time. For some reason, the Romans loved bathing in public (it’s true, ask any Asterix fan). They would spend hours lolling about in exquisitely decorated bath houses wheeling, dealing and probably plotting Caesar’s downfall. Naturally, a town’s status often depended on the quality of their public baths, among other things. So they needed a reliable water supply other than nearby streams and river, which were somewhat oversubscribed. So they fine-tuned the aqueduct. underground. They were also characterised by a network of cisterns, water tanks, dams and sluices to regulate the water supply. In fact, if you were a citizen of standing with a little political ambition, all you had to do was contribute to the construction of an aqueduct to get onto the local council. The Romans obviously weren’t exactly big on free and fair elections. 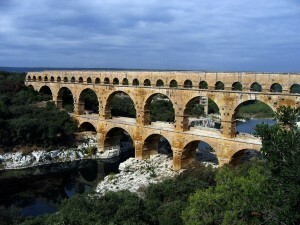 Of course aqueducts were architectural wonders, but they did have their weak points. During times of war (and there were plenty of those), all the marauding army had to was gain control of the aqueducts to beat a town into submission. In fact, in one legend the invaders actually crawled through the tunnel system to gain access to a town. The use of aqueducts wasn’t limited to Rome itself, two of the best preserved examples are Pont du Gard in France and the Aqueduct of Segovia in Spain. Until Columbus and his men set forth in the 1500s to find new lands and terrorise the natives, the general consensus was that the earth was flat and there was a point of no return. At this point you would fall into a black abyss if you crossed it. You can imagine the surprise and disbelief of early explorers when they discovered that a Mayan civilisation had perfected the water supply to their mountain citadels – and to add salt to their wounds, the Mayans had done this a few hundred years before the Romans. In its heyday, Tikal (in today’s Guatemala) was home to anywhere from 45 000 to 90 000 people, with no other source of water other than the rain. But then, being in the heart of a tropical forest, rain was plentiful. 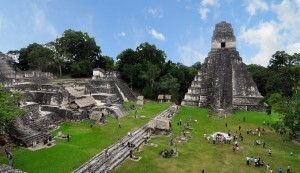 The inhabitants of Tikal made the best of the wet weather with a series of 10 reservoirs, the largest of which was only completely excavated a few years ago and measured 79 metres long and 10 metres high. And they believed in recycling too. They used the quarries where they got the stone for their temples and buildings as reservoirs. They also cleverly harnessed the architecture of the city to maximise the runoff. All their beautiful plaza, roads and buildings were plastered to be virtually waterproof, so that all the surface water was channelled into the reservoirs. The Tikalians also weren’t scared of going the extra mile (literally) to make sure the water stayed pure. With the nearest source of quartz sand being more than 30 kms away, they hauled massive amounts of the material in for the sand filters built into the water system. Amazingly, this system sustained the city for 1500 years. Another short hop across the ocean lands us in Australia. Besides having a great big patch of desert slap bang in the middle, even the more green parts of the country along the coast have known the odd drought or two. 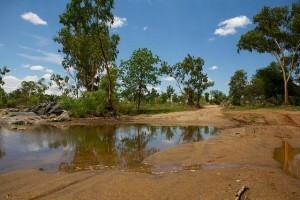 So how did the Aboriginal people survive for 1000s of years on a very limited water resource? Simple really. They learned to live with the land and use signs from nature to point them towards water. The birds, animals, vegetation and even the lay of the land gave them clues. They would stalk dingos and birds to lead them to hidden springs and waterholes. Likewise it was pretty much common sense to work out that sudden patches of greenery or trees in the middle of nowhere were going to be near water. Other vital sources were areas where water had seeped through the desert sand and been stored in underground waterways. These were traditionally known as soaks. Imagine the excitement when a soak was found, the Aborigines would get to work digging a hole, several metres deep until it filled with clear water. The next step was to protect this special place at all costs. They would cover the opening with branches and dead trees to keep animals out, and reinforce the walls with a cement-like “slush” – mud that dries and hardens to keep sand and other loose debris falling into the water. Of course getting down to the water could prove a challenge, so people would either slither down the holes on their bellies or climb down toe holds dug into the sides of the well. A series of these wells still exists at Bull Gully in Maryborough, Victoria. At 130 centimetres deep and holding 160 litres of water you can still draw water from them today. Remarkably they’ve never been known to run dry. When the early settlers came along, they relied heavily on the Aborigines’ indigenous knowledge to survive in the Australian hinterland. In fact, many of the old roads in New South Wales traced the Aboriginal walking trails, probably because they were close to water sources. Since then, Australia has built a complex infrastructure to ensure water supply and security to its cities, towns and agricultural holdings. And for the most part it is as easy as opening a tap (unless you’re lost in the desert, of course). But this doesn’t detract from the fact that Australia is still an arid country, with the average Australian using 282 litres a day. That’s why alternative water saving methods are critical and there’s a strong drive to encourage rain and stormwater harvesting using tanks and water storage systems in urban and rural areas. In fact many Australian governments offer incentives and rebates for households investing in water conservation and storage. According to the Australian Bureau of Statistics, 32% of just over one-fifth (21%) of households in Australia with a dwelling suitable for a rainwater tank reported that they had a rainwater tank in March 2010. South Australia had by far the highest percentage of dwellings with a rainwater tank (40% in Adelaide and 83% in the rest of the state). Saving water was the main reason reported for installing a rainwater tank (by 42% of households). These figures are a good indication that Australians are continuously aware of the shortage of water on their land; becoming more and more productive about helping to save Australia’s water. However, there is still much room for improvement, and many opportunities for water harvesting systems to be put in place. By installing water storage tanks and using rainwater for various applications, households, farms and industries are helping to relieve drought problems by essentially providing an ongoing water supply they have harvested themselves. Water supply and conservation is still as critical today as it was 100s and 1000s of years ago. Scientists are increasingly looking at how our ancestors did it and adapting their methods to meet modern needs. By studying their patterns, it is possible to learn a great deal. With regards to water harvesting, many ancient civilisations appeared to be ahead of their time, putting systems in place that helped them to survive and thrive. Studying their systems and educating ourselves can only assist us in conserving our water. The Indus Valley Civilisation existed from 3300-1300 BC. There’s been a lot of speculation as to its decline, but the most likely scenario is natural climate change. The Ancient Egyptians lasted from 3050 to about the 3rd century BC. The culture was remarkably resilient in surviving occupation from the Romans, Persians and finally the Arabian Muslims. Rome ruled large chunks of three continents for about 500 years. It all started with Octavian beating the legendary lovers Mark Antony and Cleopatra in a battle in 27 BC until it fell in Europe in 476 AD and was absorbed in the Middle East in 610. The culture that brought us the miracle of chocolate, the Mayan civilisation lasted from about 2000 BC till the arrival of the Spanish in the 1500s, making it one of the most enduring of all ancient people. Long, long, long before any of the other cultures mentioned even existed, the Aborigines had been calling Australia home for about 45 000 years. Unlike the Indus, Egyptians, Romans and Mayans, the Aborigines were nomads in an arid land, yet their water storage methods played an equal, if not more important role, in their survival.